Usually I don't post "housekeeping" news, but a couple of great things are coming up. I will soon have my own domain and will post my reviews and lists there. In the meantime, you can start following my cinematic updates on Twitter. I'll post every time I update the blog and will post more info on the new domain. Hope to see you there! The last surviving copy of the film was a nitrate print from Jack Warner's private collection and was able to be copied, although minor damage prevented the print from being totally pristine. That was okay. ghetto of New York City. He grows up to be a famous violinist, yet a strong duty to his family and country remains. 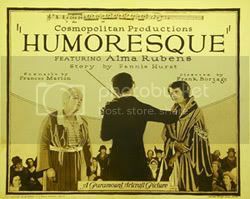 The silent film was accompanied by Cliff Retalick (piano/organ) and Grace Gabe (violin). The irony was that Ms. Gabe was playing the violin parts for a character who earned thousands of dollars per performance, while she was offering her musical services that night for free. Leon's father, who is now a grandfather due to his other children being grown and having their own children, encourages his grandchildren to practice their music so they can make as much money as Uncle Leon. I find this interesting too, because writer Frances Marion and/or Frank Borzage make a specific point that the reason Leon was successful and earned as much as he did was because of his passion for music. That is the link between him and his audience that made him so beloved. 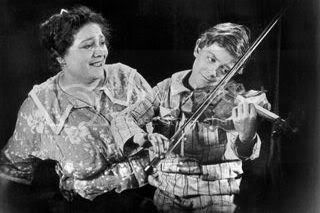 Leon even wanted to play the violin when his father was initially opposed the idea: he thought his son would not be able to make a decent living out of it. Even if the grandchildren did practice, a strong love of music was absent. They probably would not be successful, because they did not have the same tenacity that Leon did. Leon has two women in his life: his mother and his sweetheart Gina (whom he has known from childhood). Gina used to be a cripple and we know she will love Leon no matter what when he signs up to fight for Uncle Sam. His mother has always been loving. In an awkward yet moving scene before Leon departs, she begs him to sit on her lap and be her little baby one more time. The mother perhaps is too devoted and clingy to Leon, however never once have we seen the mother when she is unkind or does not support Leon. She has always been proud of him, and Leon willingly obliges his mother whom he loves. You would have to see it to believe it, though. The end is a little melodramatic. Frank Borzage always infuses his movies with reality. He is not going to mislead us into thinking that although thousands of boys died in World War I, our hero will remain unscathed physically and emotionally. Both Gina and Leon's mother will ache when they face disappointments, but they are strong and admirable women with little thought for themselves. While this film is not among Frank Borzage's greatest accomplishments, it is still a solid effort. Film historian Cari Beauchamp spoke at the showing and noted that screenwriters had greater power than directors in those days. Frances Marion adapted the story and was responsible for casting Vera Gordon, who played Leon's mother. Still, Borzage showed signs of greatness even in this early film and would go on to direct great features, such as: Big City, History is Made at Night, Street Angel, and 7th Heaven.